By Karrar Haider in Desktop. Updated on September 18, 2018 . Left-click of your mouse is the most used function that helps open files and programs and confirm commands on your PC. Likewise, its non-functioning is one of the most common PC problems that users often face. There could be dozens of reasons why left-click may not be working properly or stops working at all. In this post, I will list some of the most accepted solutions to fix left-click not working issue by users who faced this problem. Let’s take a look. Firstly, you need to check if it’s a software problem or there’s an issue with the hardware. To check the hardware you can simply connect the mouse to another PC and see if it works there or not. If you don’t have access to another PC, you can also try connecting any other mouse to your computer to see if it faces the same problem. If it turns out that the hardware was faulty, then obviously you’ll have to get the mouse replaced. If it turns out that the hardware of your mouse is working fine but the mouse is still behaving strangely, then it may be a problem with the software that needs to be solved. There can be two issues with your mouse i.e. either the left-click is not working in specific areas or it is not responding at all. So in the write-up below, I am going to lay out the solutions to fix both of these problems respectively. Tip: As your left mouse click isn’t working properly, you are going to have a hard time following the instructions I will be providing in this article. You should read my article on how to control Windows only with a keyboard. This will allow you to not depend on the mouse and follow the instructions using the keyboard buttons. Simplest solutions are usually the best ones. Just turn off the PC and turn it back on to see if this fixes the problem. During the restart process, many driver conflicts and corrupted system files related problems can be solved automatically. So this may fix your problem as well. Windows has a built-in hardware troubleshooter that can scan and solve many external device problems automatically, such as problems with the monitor, keyboard and the mouse, etc. To run the troubleshooter, go to the Control panel and open "System and Security". Here access the Troubleshoot common computer problems option under the "Security and Maintenance" heading. Now open Configure a device option under the "Hardware and Sound" option and start the troubleshooting process. Windows will scan and automatically try to solve the problems if detected. If it can’t solve the problem, it will let you know what is the problem (if detected). Good to know: If the troubleshooter gives error Hardware changes might not have been detected, then there is no need to get skeptical. "Troubleshooter" usually gives this error just to be sure you don’t miss any recent hardware changes. It most probably has nothing to do with your left-click problem. Sometimes your antivirus programs – especially the one with an anti-keylogger – may mess with the proper working of the mouse. To try this, uninstall your antivirus program from the control panel and restart the PC. If the issue is resolved, you may reinstall your antivirus program again. There is a good chance the issue will not occur when you will reinstall. Although can also get a different antivirus solution, if the problem keeps arising. The issue of left-click not working has been resolved for many users simply by re-registering Windows Apps. Any misbehaving Windows app that might be causing the issue will be fixed using this solution. To re-register Windows apps, press Windows + R keys and type powershell in the "Run" dialog. "Windows Powershell" interface should open up. Here enter the below mentioned command and press the Enter key. Powershell will re-register all the packages now. If you see any warnings in the process, just ignore them. There is also a chance it could be a problem with a corrupted Windows system file or an update. Microsoft support has a handy article on how to fix and replace corrupted system files and Windows update files. You can refer to this article to try to fix any system or Windows update files that might be causing the issue. If you faced this issue right after a Windows update and the above solution didn’t fix it, then you can also uninstall recent Windows update files in an attempt to fix the issue. From the Control Panel, go to "System and Security" and then open View installed updates option under the "Windows Update" heading. Here you will see all the Windows update files with the recent one on top. Check the time of update’s installation and uninstall all the updates that were installed right before the left-click issue arise. If the left-click is missing clicks or acting weirdly, then there is a chance that a key on the keyboard might be pressed and stuck. Left mouse click works differently if there is a key pressed on the keyboard, such as Ctrl, Spacebar, Shift, etc. Press all the keys on the keyboard and make sure there are no keys stuck. If you are on a laptop and using an external mouse, then turn off the touchpad on the laptop. There is a chance the touchpad might be interfering with the external mouse. There should be a button near the touchpad to turn it off. A newly added program may also be the cause of your mouse’s left-click issue. Just uninstall all the programs that were added right before you faced the issue and see if it solves the problem. You can uninstall one program at a time to find the culprit. If left mouse click isn’t responding at all, then most probably it’s a driver issue. The above solutions may be able to fix this issue as well – especially the solution #4 – but a corrupt driver is the most common reason for the left-click not working at all. To fix this, press Windows + R keys and type devmgmt.msc in the "Run" dialog. The "Device Manager" will open up and you will be able to see all your hardware devices here. Here move to the Mice and other pointing devices option and press the "right arrow" key on your keyboard to expand it. 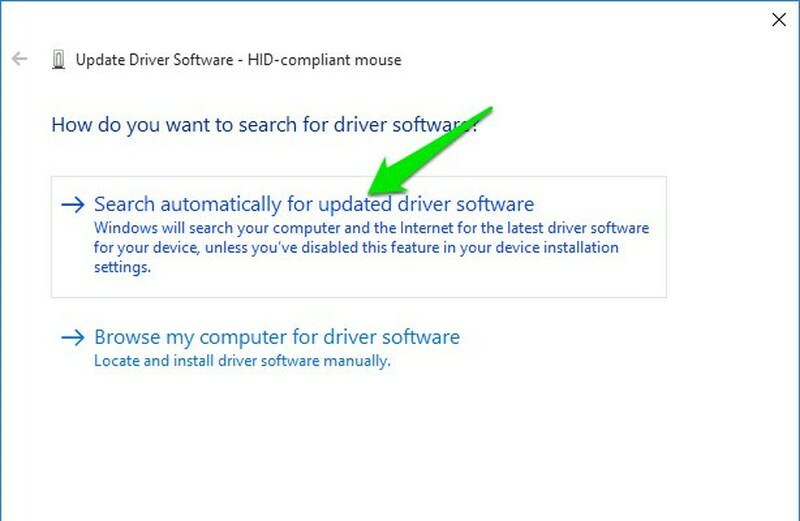 Now right-click on HID-compliant mouse option and select "Update driver software". 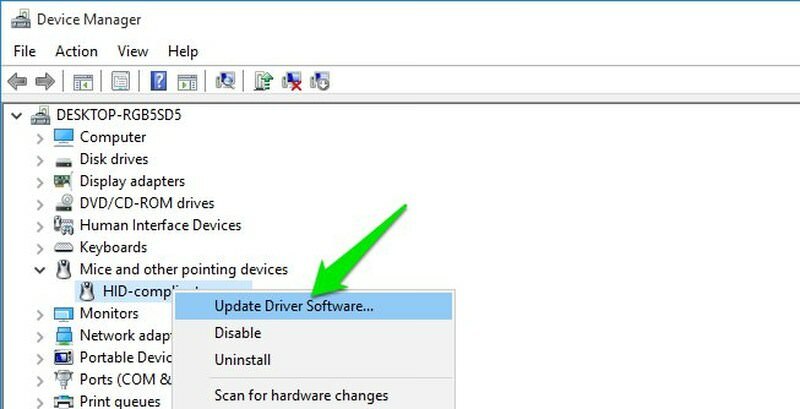 On the next page, select Search automatically for updated driver software option and Windows will automatically update the driver. 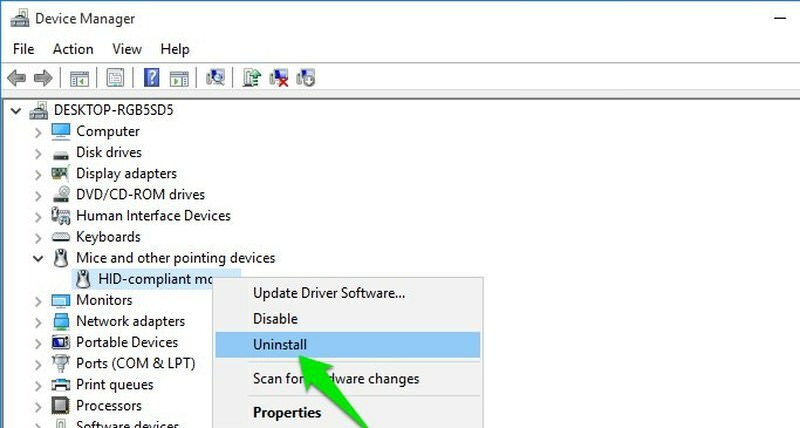 If this doesn’t help, then right-click on "HID-compliant mouse" option again in the "Device Manager" and select Uninstall to uninstall the driver. Afterward, disconnect the mouse and restart the PC. When the PC boots completely, connect the mouse again and let it reinstall its driver. This should fix the left mouse click. In case it doesn’t, then most probably it’s a hardware problem, not a software problem. If the problem is still not fixed and you are committed that the problem is with the software and mouse itself is perfectly fine, then you can also reset your PC that will solve almost any software problem. Now you have three options here; you can restore PC to a state it was before the left-click issue started, reset Windows settings and native data without deleting your personal data, and completely reinstall Windows and delete all the data. You should try to restore to a previous restore point older than the date you faced the left-click issue. This is the safest option with the least impact. However, if this doesn’t work, then you can reset your PC that will surely fix all the software related problem. Although make sure your important data is backed up before resetting your PC to ensure you don’t lose any important data. Here is a complete article by Microsoft showing how to restore, soft reset and hard reset your Windows PC. If your mouse is working fine, then the above solutions will surely be able to fix any software issues that are causing the left mouse click to not work properly. In case the problem still persists, then share your problem in the comments and we might be able to help.